Inevitably, a number of myths sprang up around the B-29 and the author has put the record straight by using primary source documentation. 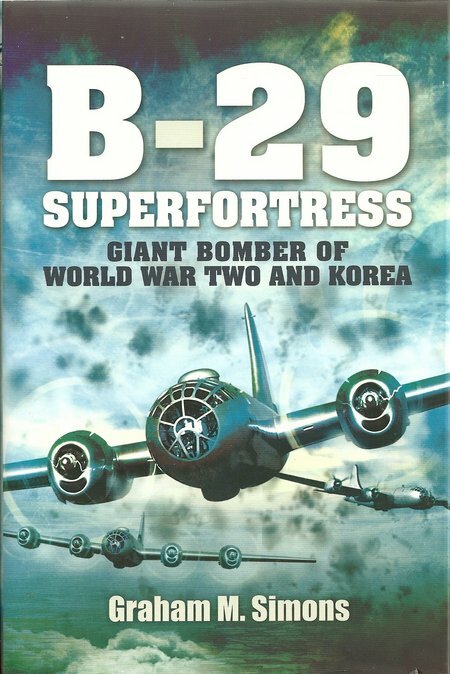 This is a nicely written account of one of the major steps in aircraft design that has received less than its due in recognition because the Pacific air war has not achieved the coverage of the European campaign and the introduction of jet aircraft has captured the imagination more strongly, leaving the B-29 as an inbetweener coming after the famous Lancaster and the B-17 and B-24 bombers. The author has provided readable text from careful research and this has been further enhanced by adding a large number of photographs and drawings in illustration of the text. This is a book that no aviation enthusiast should miss. DESCRIPTION: The US entered the Second World War with a very mixed collection of aircraft. Its monoplane naval aircraft were very successful and the British FAA depended on Grumman fighters aboard its carriers, even after marinizing the Hurricane and Spitfire. The USAAF was less successful in its equipment. Its fighters were flown at low to medium level when the European air war was seeing combat at high altitude. Its bombers had advantages and weaknesses. Notably, the Norden bomb sight was excellent and the B-24 and B-17 heavy bombers had good range and an ability to fly at high altitude, but their bomb load capacity was disappointing and initially they were inadequately equipped with defensive guns. Eventually, the defensive armament was significantly increased and long-range fighters were assigned to the bomber streams to further improve survival rates. It can therefore be said that the USAAF was eventually equipped to fight the bomber war in Europe and continue to fly daylight missions with large numbers of aircraft. In the Pacific, the US faced different challenges. It was believed that the rapid Japanese advances would run out of steam, as supply lines became extended, and that the Japanese would be unable to find a way of attacking the continental US. The very successful propaganda raid by B-25 bombers flown off an aircraft carrier was not something that could be relied on as a standard method of attacking the Japanese home islands and clearly there was a need for a large long-range bomber that could fly above fighter defences and drop a significant load of bombs. Where in Europe USAAF heavy bombers were unable to carry large bombs routinely carried by RAF Lancasters, and where the brilliant multi-role high speed twin engine British Mosquito could not only fly faster than German fighters, but carry as large a bomb load to Berlin as the four engine B-17, the US needed a major step forward in design and that step was to be the B-29. The B-29 performed outstandingly in the Pacific and again over Korea. It also served legitimately in the RAF during the 1950s as the Washington and illegally with the USSR and China where the Tupolev Tu-4 was a bootleg copy produced by stripping down B-25s that had made emergency landings in the USSR and making copies of all the components. Previously, aircraft manufacturers had designed bombers specifically and exclusively as bombers. Later in life a bomber might have been modified to serve in another roles such as glider towing and as a transport, but this was expediency rather than initial intention. The B-29 was envisaged as part of a family of aircraft. As a result it was used as a reconnaissance aircraft, a pioneering in-flight refuelling tanker, a trainer and with a figure eight twin deck fuselage as an airliner. It was also developed into the B-50 bomber. During WWII the B-29 was one of the largest aircraft flown and introduced a number of significant advances in technology. The inclusion of pressurized cabins allowed the B-29 to routinely fly at high altitudes and that also introduced one major challenge when B-29s experienced the effects of jet streams over Japan. Initially the crews were accused of poor navigational skills and even cowardice after they failed to achieve bombing targets when their planes had an unequal fight with the high-speed winds. A Japanese scientist had discovered jet streams in the 1920s but his paper on the phenomena was written in Esperanto in the belief that it would be more widely read than had it been written in Japanese. Unfortunately this ensured that no one read it and it was left to B-29 crews to rediscover high speed, high altitude wind patterns that are today routinely exploited by airlines in planning jet passenger flights. High altitude pressurized flight was therefore a mixed blessing because although it took the aircraft above the reach of defending Japanese fighters, it made navigation and bomb aiming harder. It also introduced a design challenge because however high or fast a bomber flies, eventually fighters will be developed to catch the bombers. Therefore, the B-29 needed a heavy machine gun armament similar to the B-17 flown over Europe, but it was not practical to design power-operated turrets with a gunner in each turret. To address this challenge, the B-29 introduced electronic fire control and remote operated twin .50 cal power turrets, which also produced a much cleaner set of lines with the unoccupied turrets being almost flush with the skin and small Perspex observation bubbles also adding little to drag factors. The B-29 was to remain in service long after WWII, a few being used as flying television transmitters, and finally retired in the early 1960s. 3,960 B-29s were built but the one B-29 that was to become immortal was Enola Gay, which dropped the first Atom Bomb on Hiroshima. The second B-29, that dropped an atom bomb on Nagasaki shortly after, failed to become an internationally recognized aircraft like Enola Gay. The bombing campaign against Japan also meant that the B-29 was thought of as a fire bomber because the typical bomb load was a mixture of high explosive and incendiary bombs to destroy the largely timber-built Japanese towns. In fact, the B-29 was designed to carry a copy of the British Tallboy earthquake bomb, although it was decided not to include an ability to carry the much larger Grand Slam, which RAF Lancasters had used successfully against high value underground targets in Europe.